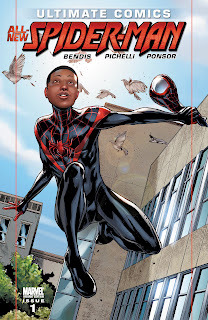 "You met Miles Morales this summer, but now you can learn just how this regular kid from Brooklyn gained super powers…and just how it’s all tied to Peter Parker, the original Spider-Man! 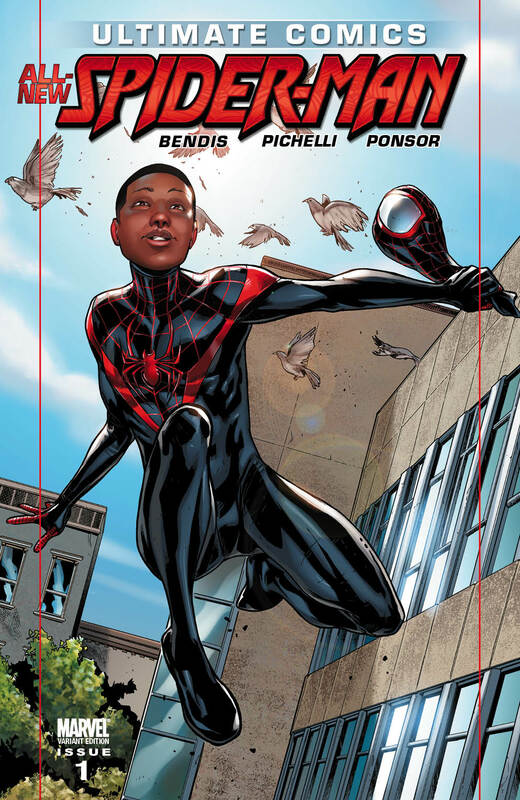 But before Miles dons his all new Spider-costume, he’ll first have to deal with dangers—and secrets—like no other super hero has experienced before. 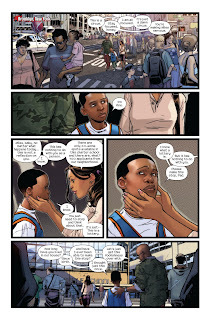 Superstars Brian Michael Bendis and Sara Pichelli present the new comic book series that’s captured the attention of fans, press and pundits from all over the world—and deliver a new kind of super hero for the 21st century." Firstly, let me get this out of the way. I personally think that having an African-American/Hispanic kid, and he is a kid, in the top spot will present not only diversity in the cast of characters but will also allow for some personal issues that would never have been faced by white-bread Peter Parker. In fact, I hope that the troubles that Morales confronts on a personal level will be able to reach readers of mixed ethnicity or those in a minority group, much in the same way that Peter Parker reached me. Writer Brian Michael Bendis has already reassured readers by stating that Morales will be mentored into the role by Parker, so fear not, he will be present. Brian Michael Bendis is without a doubt one of the hardest working people in the comic book biz. Somehow he manages to write approximately 37 monthly books, Tweet 795 times a day and raise his 14 children. I may be exaggerating but that's what it seems like. 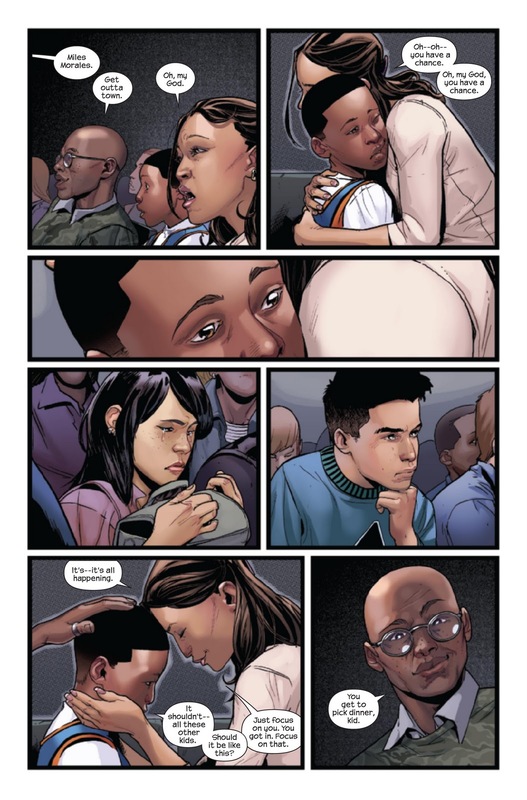 He introduces us to Miles as a young and extremely moral chap who within the space of five panels shows a level of enlightenment far beyond his years. I could instantly tell that I'm going to like this kid. He epitomises everything that you would ever want in a child. We are also introduced to a number of other characters within Miles' family who are also fleshed out masterfully by THE Marvel Architect. 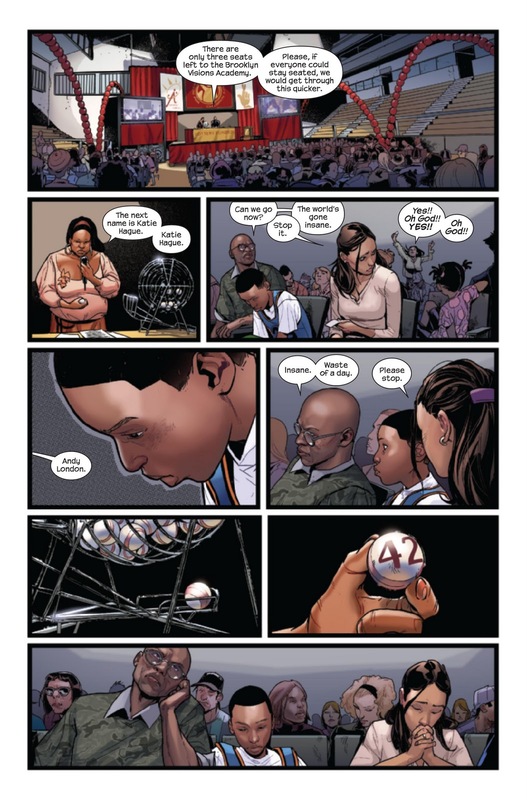 Ultimate Spider-Man #1 is among the best books that Bendis has ever written. A big call but I was honestly blown away by how much character building he managed to fit into a single issue. Surely this was aided by the omission of a suited up Miles leaving us something to anticipate in a month from now. Bendis has always given artist Sara Pichelli a great deal of praise and this book shows us exactly why. The lack of action allowed Pichelli to show her chops as an artist able to deliver a highly emotive style without too much emphasis on facial cues. She easily matches, and compliments, the writing style of Bendis in this issue. Justin Ponsor should also get a nod for his beautifully mindful colouring which used a lot of muted tones to give a sense of realism to the New York City streets. I could almost feel the cool chill of shadows while walking the streets of Brooklyn. Stylistically speaking, another interesting addition is the use of what I can only describe as being a newsprint style dots for tone which made me feel all sorts of nostalgia. It didn't come across as an attempt at pointillism as it was just used in black and not in an effort to create luminosity. This comic comes polybagged so you won't be able to have a flick through before you buy it. My recommendation is that you don't let this deter you. 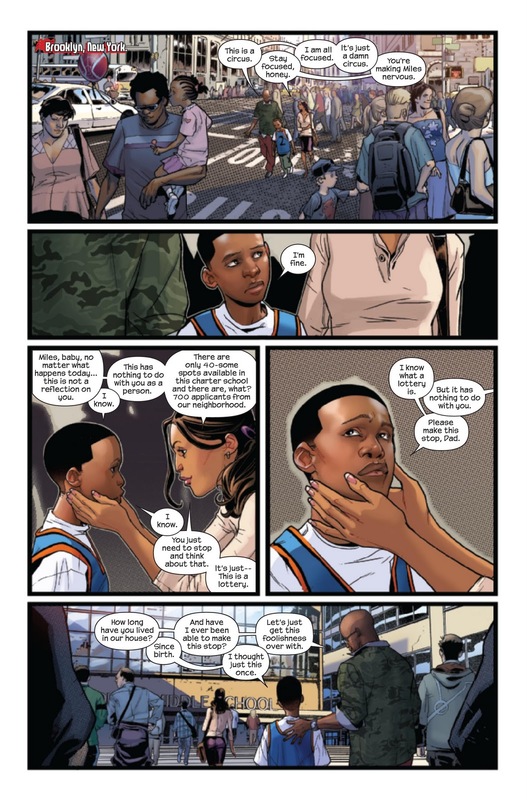 Everyone has heard about how good Ultimate Spider-Man #1 is. I can only say that every positive review is right on the money. 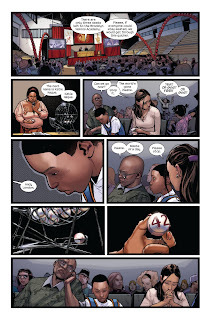 Ultimate Spider-Man #1 is one of the best comic books I have read all year. 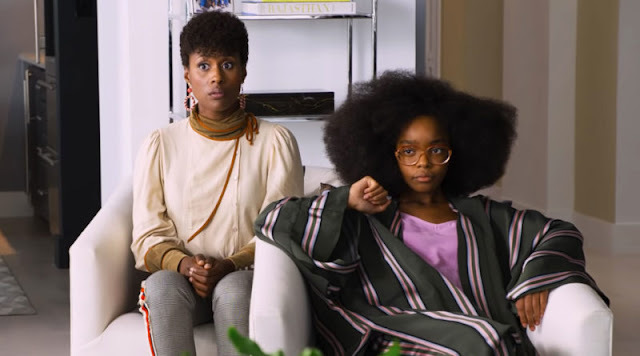 It's a study in character building and in that, an absolute triumph. I adored this book and cannot recommend it any higher. 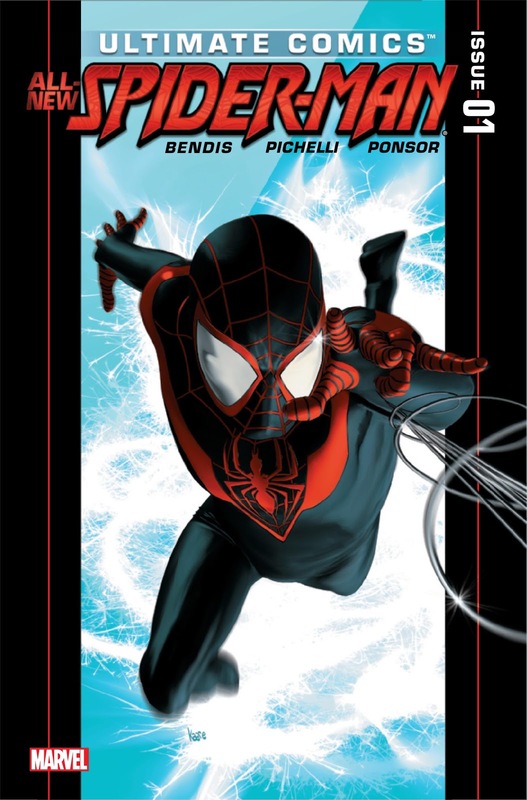 Ultimate Spider-Man #1 is available now in comic book stores and on the digital market. As a side note for Australian readers, at the time of writing this review The Comic Shop still has plenty of copies of the first print in stock but be quick!